Luna Moth Wings can be acquired by catching luna moths. You receive two wings for each moth you catch. Luna moths only come out at night but their glowing wings make them easy to spot. 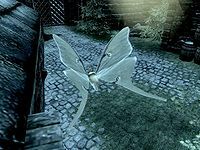 "As with the dragonflies, I was taken aback by the number of butterflies, moths, and other insects that manage to thrive in Skyrim. The Luna moth is especially beautiful; its thin, almost ephemeral wings seem too delicate to hoist anything into the air, giving them an almost magical appearance. Indeed, that sense extends to the properties they exhibit when crushed and distilled (an action I admit was difficult to perform at first, no matter my resolve to discover all that Skyrim has to offer. These creatures are simply that beautiful!) While they can be used for creating poisons that damage magicka, I feel that would be a waste of their potential. Do not be alarmed if, when the wings are broken down almost completely, they appear to almost disappear under your mortar. That very quality makes the wings quite effective in potions of invisibility!" - Agneta Falia in the Herbalist's Guide to Skyrim. This page was last modified on 30 August 2018, at 16:14.